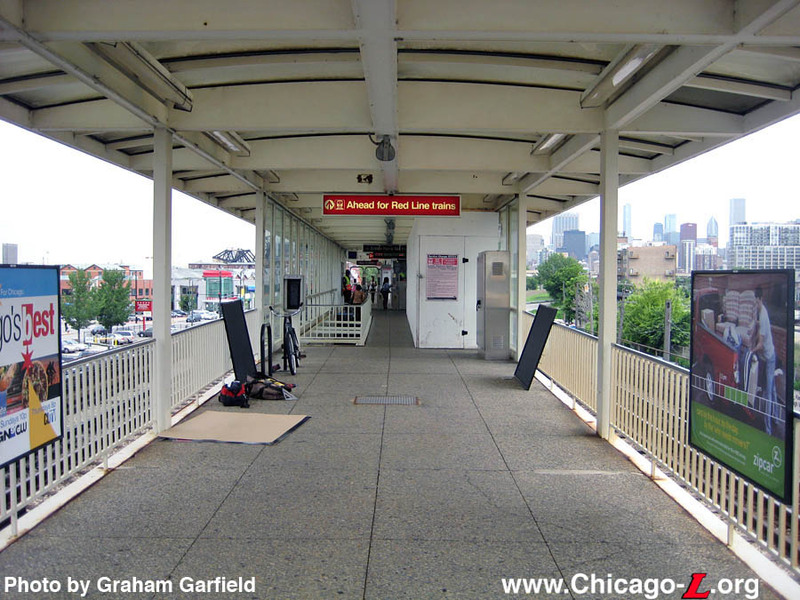 The design of Cermak-Chinatown and the other eight stations of the Dan Ryan line were carried out by Skidmore, Owings & Merrill under the direction of Myron Goldsmith, who developed a modern, functional form in the late International style popular at the time. Improved visibility and security, ease of cleaning and more comfortable working conditions for CTA employee were design goals. Skidmore took the Kennedy-Dan Ryan ("KDR") project in a unique direction, designing all aspects of the new lines to harmonize in both shapes and materials. All windbreaks, dividers, and ticket booths were stainless steel. The supports of the transparent platform canopies and the structures of the station enclosures are white-painted steel frames, and the enclosures themselves are glass. The formal and functional criteria were expressed in several ways: open, uncluttered, brightly lit interior spaces; durability, safety, maximum efficiency of movement; lightness and purity of structure. The shape of everything, from the buildings to the agents' booths, to the trash cans, followed together into a seamless design philosophy, which perfectly captured the boxy, purely functional International Modern style for which Skidmore is so well known. 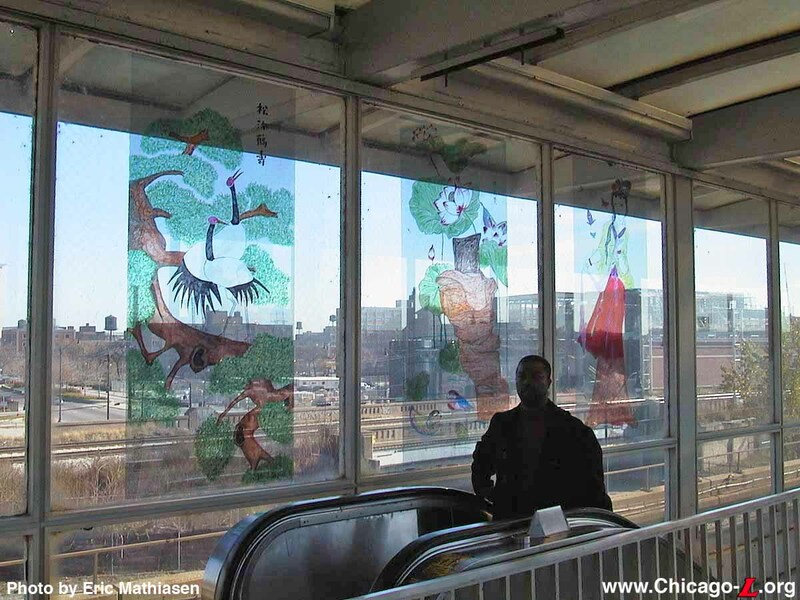 "Nine stations serve the Dan Ryan Line... Wide visibility and a high level of illumination are characteristic features in all areas. 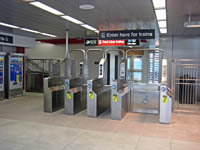 Fare collection equipment and turnstiles are stainless steel and... escalators supplement stairs for movement between station levels. Stations in the expressway medians are constructed of steel and glass providing maximum visibility from adjacent streets and highways. The boarding platforms are long enough to accommodate 8-car trains... Steel framed canopies of translucent plastic [extend] beyond the center line of the tracks. Self-service infrared radiant heaters are located at windbreaks on the platforms. 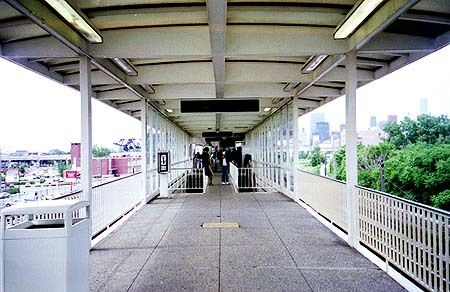 Off-street bus transfer facilities are provided at the 95th Street terminal and at 69th Street station by means of bus bridges over the expressway traffic lanes. 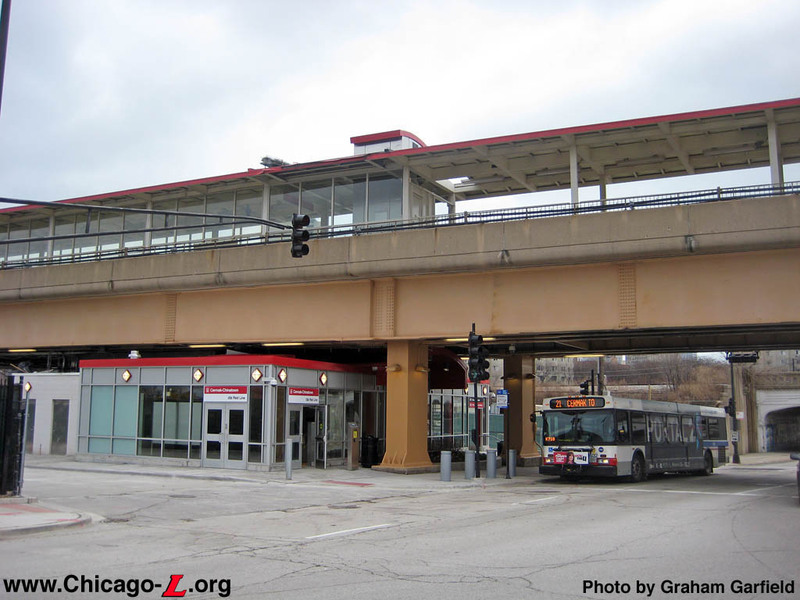 An off-street bus loop is also provided at the Cermak Road station..."
Stations were spaced at between half-mile and one-mile intervals, reflecting an increasing spacing of stations prominent in the postwar period, with bus lines acting as feeders to the rapid transit line. In terms of interior arrangement and design for the passenger, Skidmore generally followed the edict of modernist pioneer Mies van der Rohe that, "less is more." 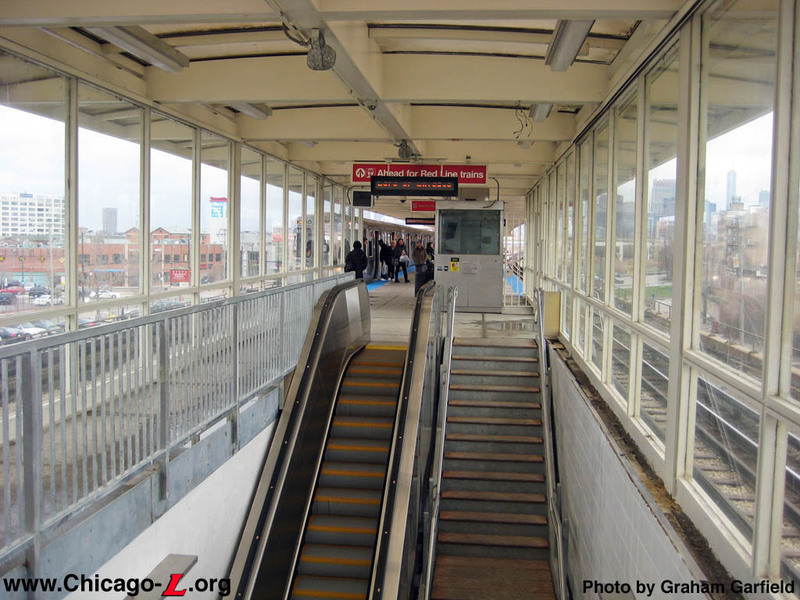 Cermak-Chinatown, like the other Dan Ryan stations as originally designed, had no real station house to speak of, only an enclosure that houses the stairs and escalator to the elevated platform. 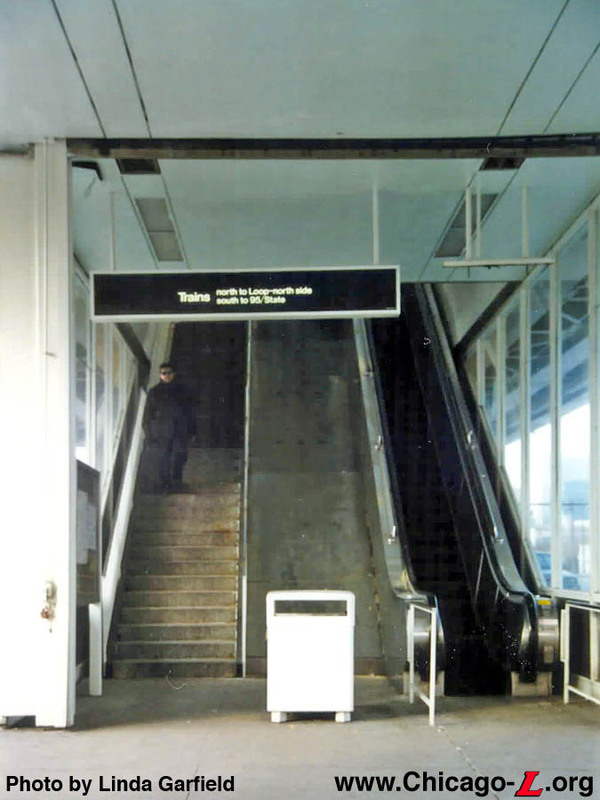 The agent booths and turnstiles were originally located at the top of the stairs, on the platform. 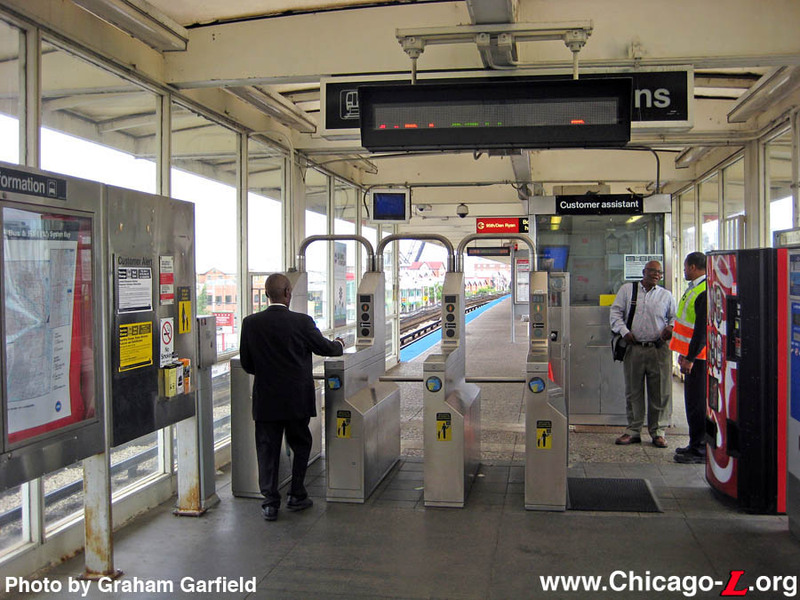 The Dan Ryan and Kennedy stations were set up to allow Pay On Train operation during off-peak hours. Except for at a few locations (most notably 95th Street terminal), there were no concessions provided for passengers. Air conditioning and a compact washroom with a toilet were provided in the agents' booths. Restrooms were for employees only, although public payphones were provided. Stainless steel turnstiles, now an industry standard, were first used here. The amenities and traffic circulation fit with the architectural design of the station: efficient but purely functional. Stations were designed with wide walkways and no blind corners, with turnstiles and agents booths arranged for maximum queuing and circulation effectiveness. The stations' design even formed a harmony with the 150 2200-series rapid transit cars that were ordered to serve the new Kennedy and Dan Ryan lines, which used the same design philosophies and basic shapes, and an entirely new system of signage with a redesigned typeface and clean graphic style (still used by CTA today, in a modified form), making a fully integrated design throughout the entire project. 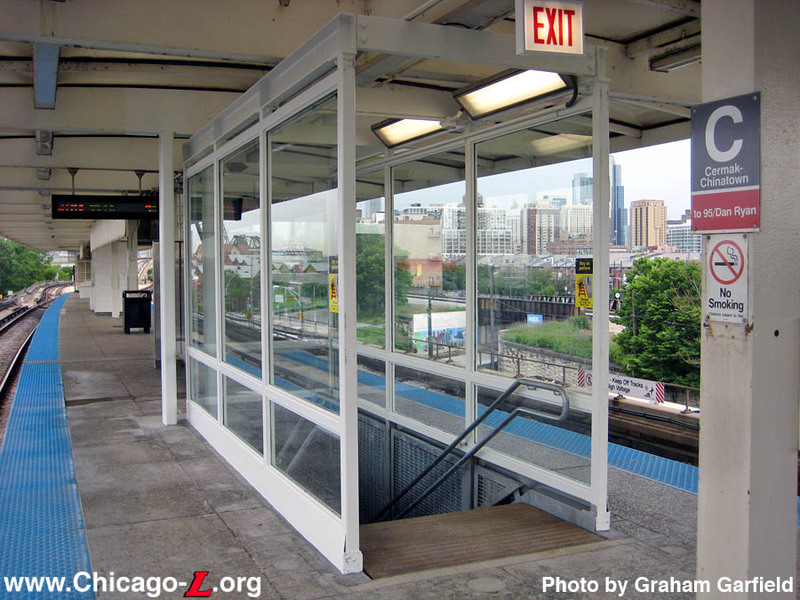 This glass and steel station was only about four blocks west of the Cermak station on the North-South Route, which closed September 9, 1977 by which time the station's patronage dropped to very low levels, probably affected by Cermak-Chinatown's presence. 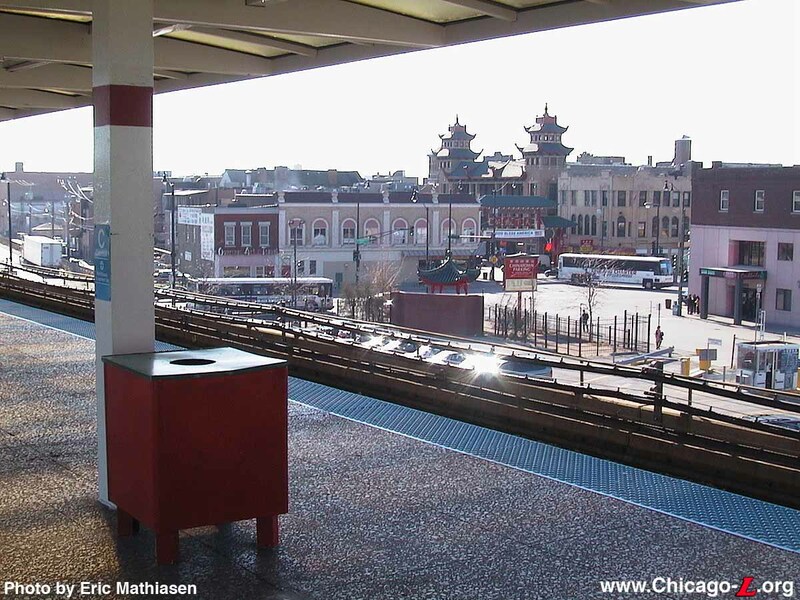 In 2001, the CTA added some Chinese identity to the otherwise stark and utilitarian Skidmore-designed station facility. 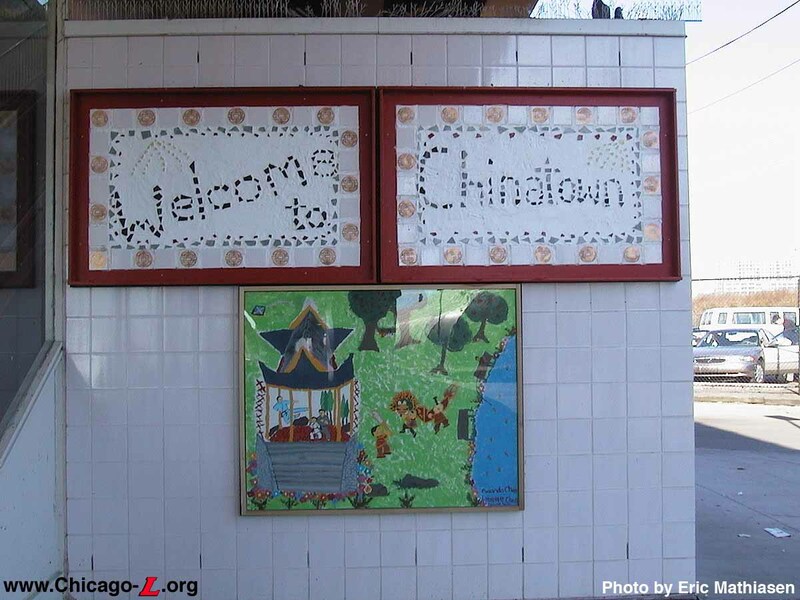 On Wednesday, January 30, 2002, the Chicago Transit Authority officially welcomed the Chicago Chinatown Chamber of Commerce as a participant in the agency's Adopt-A-Station Program at the Cermak-Chinatown station. Participating in the celebration were CTA President Frank Kruesi and Chinatown Chamber of Commerce President Ray Spaeth. 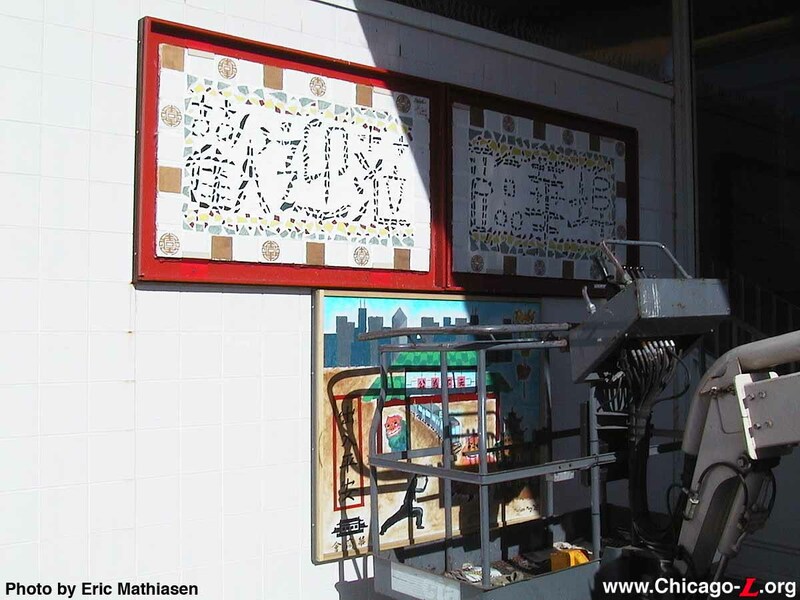 The station featured two tile murals with "Welcome to Chinatown" written in both Chinese and English. 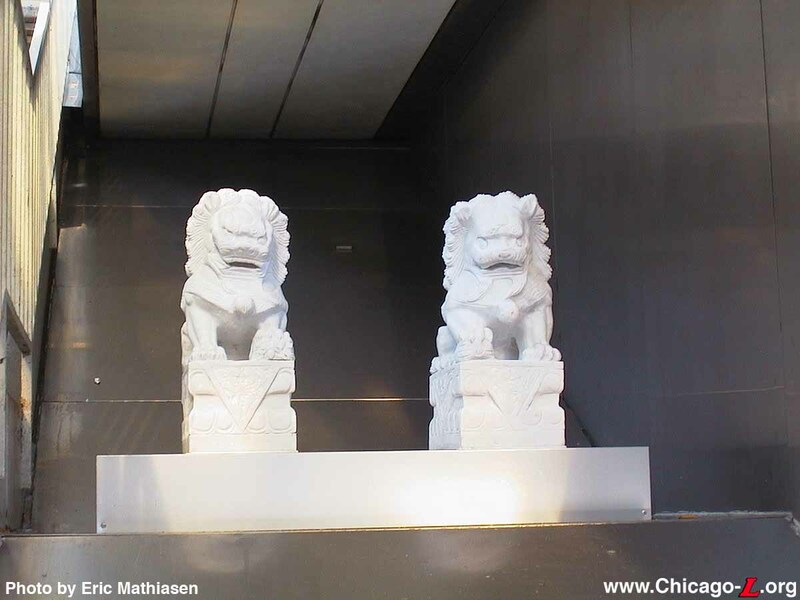 Customers using the stairs or escalator were greeted by a pair of lion statues, called "foo dogs," believed to protect against evil spirits, at the entrances. 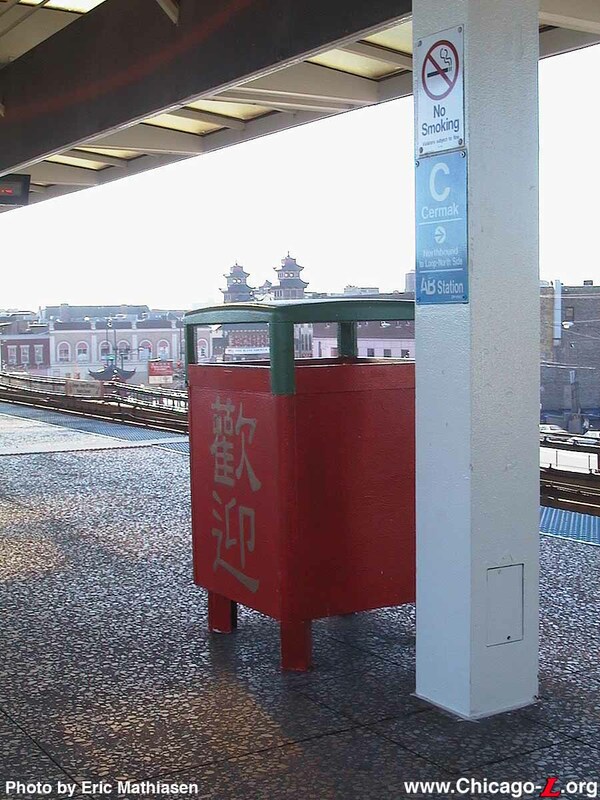 Garbage cans on the train platform were painted red and green, the Chinese colors for prosperity and longevity, with "Welcome" written on the side in Chinese in gold. Chinese artwork was also on display at the platform level. Graphic panels featuring Chinese-inspired artwork were printed on translucent film and added to some of the glass window panels in the unpaid area at the south end of the island platform. 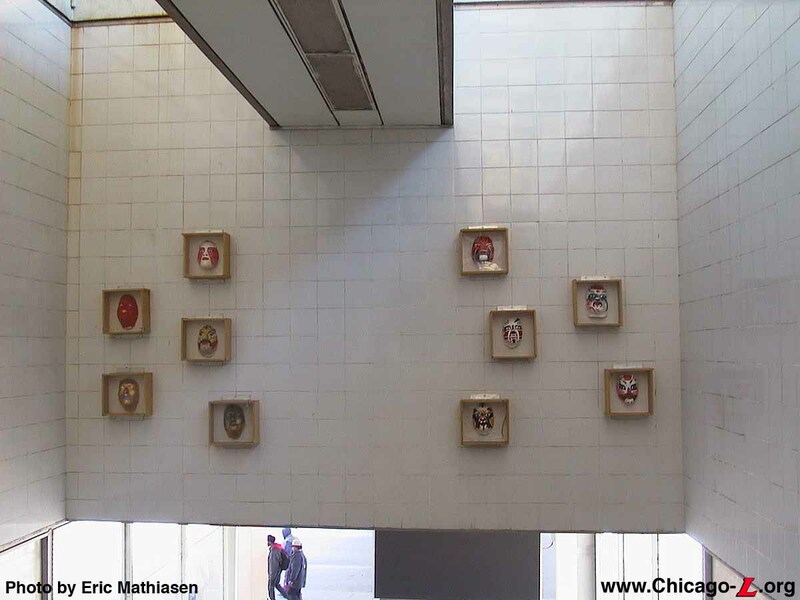 Customers leaving the station saw Chinese masks hanging on the walls along the stairs to the north side of Cermak Road. These masks were based on characters from Chinese opera and theatrical productions. The Chamber of Commerce had help from community volunteers in creating many of the artistic pieces at the station. One of these volunteers was retired Chinatown chef Yuen Hing Moy, who wanted his contribution to honor his native country's past. So Moy, 67, chose to depict the Great Wall of China, built more than 2,000 years ago to defend against marauding northern tribes and one of the country's enduring symbols. The Chinatown chamber also enlisted community youths and seniors from the Chinese American Service League to fill the station's walls and windows with paintings, masks, statues and murals that celebrate Chinese culture. Chinatown Chamber President Ray Spaeth said the project could translate into increased revenues for the 200 shops and restaurants he represents. By raising the profile of the neighborhood, he said, more CTA riders may be inclined to stop in Chinatown for shopping and dining. 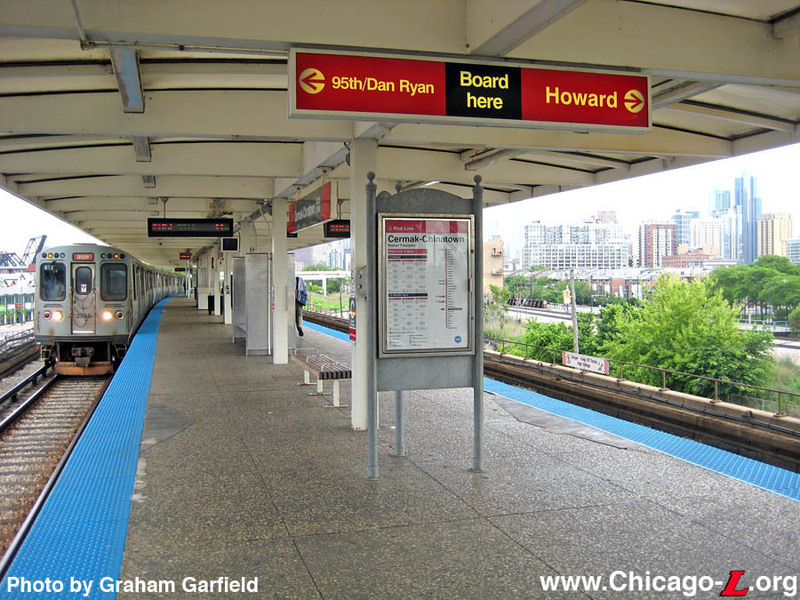 With few major improvements (though with a lot of patching) over its thirty year life, by the early 21st century the Dan Ryan Line was in need of a major overhaul. 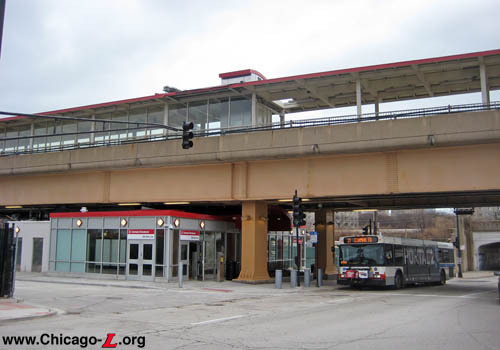 On April 3, 2003, the Chicago Transit Board approved a $4.5 million contract to renovate the 69th and 95/Dan Ryan bus bridges as well as the bus turnaround at 95th Street, signaling the beginning of the rehabilitation of the Dan Ryan branch of the Red Line. 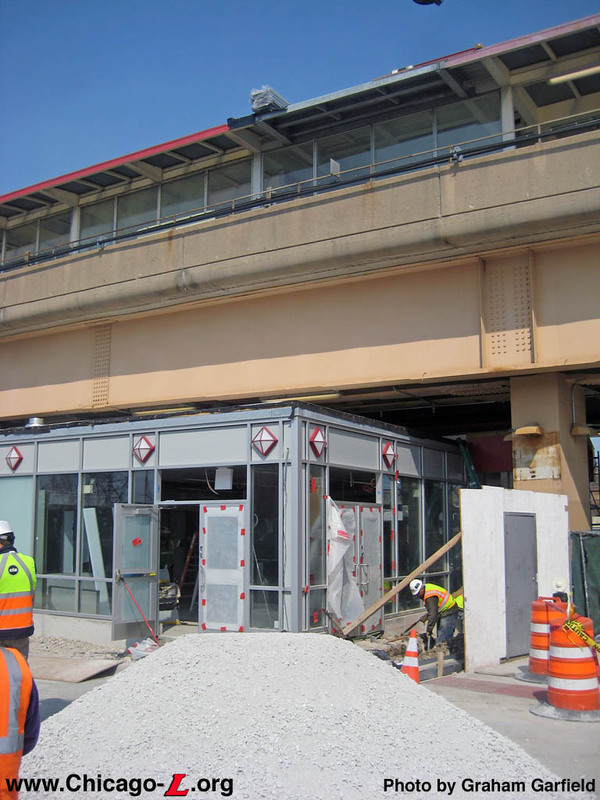 The Dan Ryan Red Line Rehabilitation Project entailed upgrading the infrastructure of the line, including improving power reliability and delivery of that power, and providing station improvements to the seven stations on the branch north of the terminal. The project was executed in three phases. 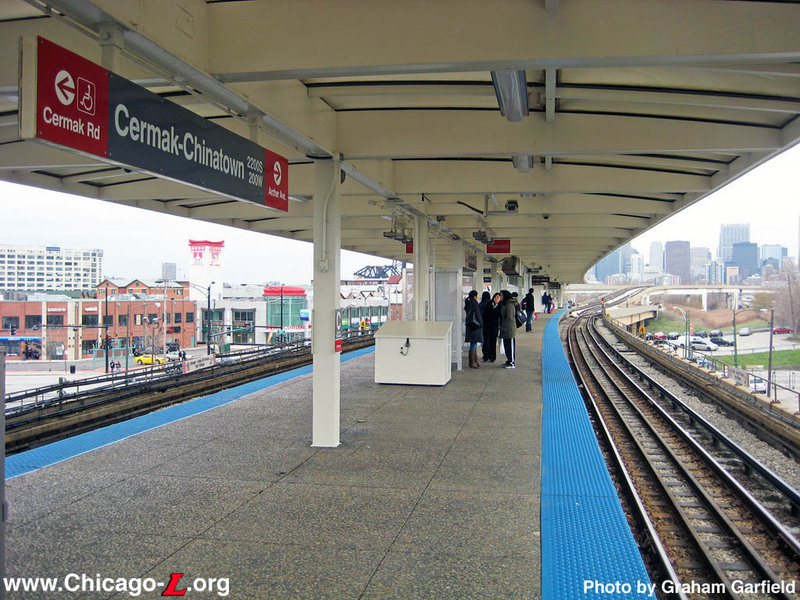 During the first phase of the project, which extended from March 2004 to May 2005, CTA replaced crossover track, installed a temporary signal system to support the track work and began third rail replacements from Cermak-Chinatown to 95th Street. 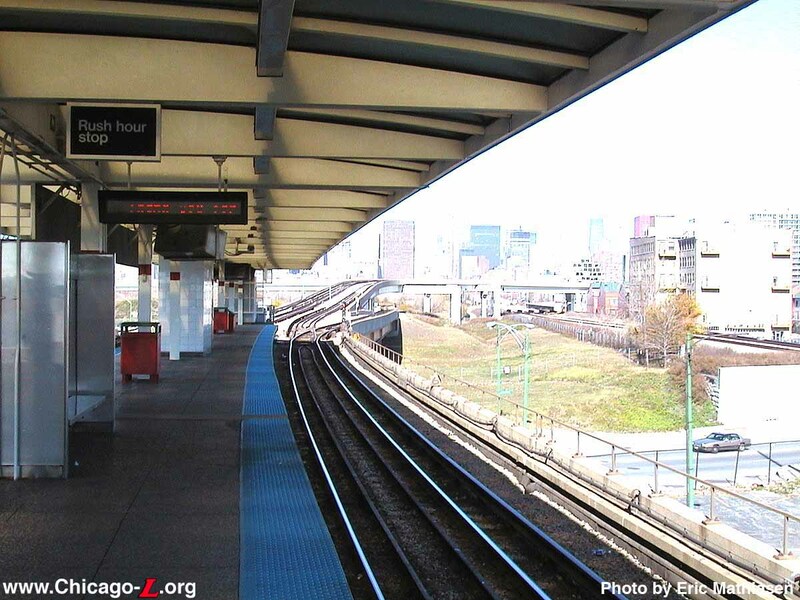 As part of Phase II, which ran through early January 2006, the CTA constructed two new substations and upgraded two existing substations, installing a new bidirectional signal system and replacing the power rail. Phase III improvements, which began at the end of June 2005, consisted primarily of station renovations. Work at the seven stations located between Sox-35th and 87th included refurbishing platform canopies, architectural components, escalators, station entrances and station houses, new station house and platform floor finishes, enhanced lighting, new customer assistant kiosks and improved signs. 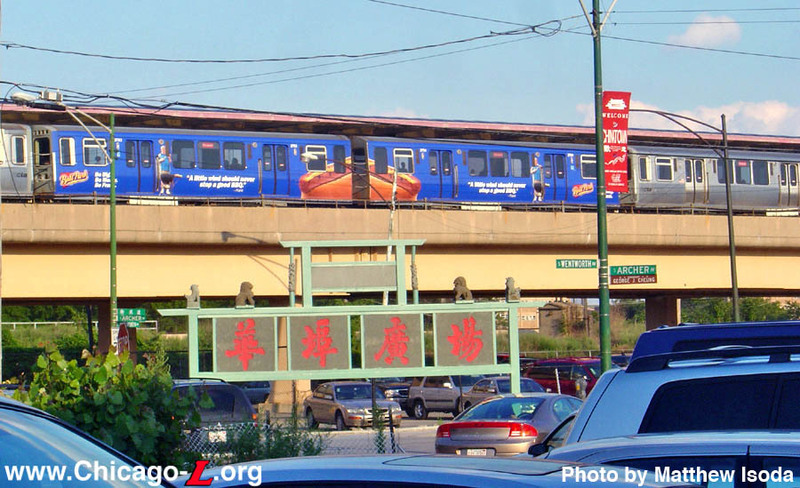 Though early plans for the project included it, Cermak-Chinatown station was not included in the Phase III station program. Improvements to the station would not be addressed for another five years, and then through a separate capital project. 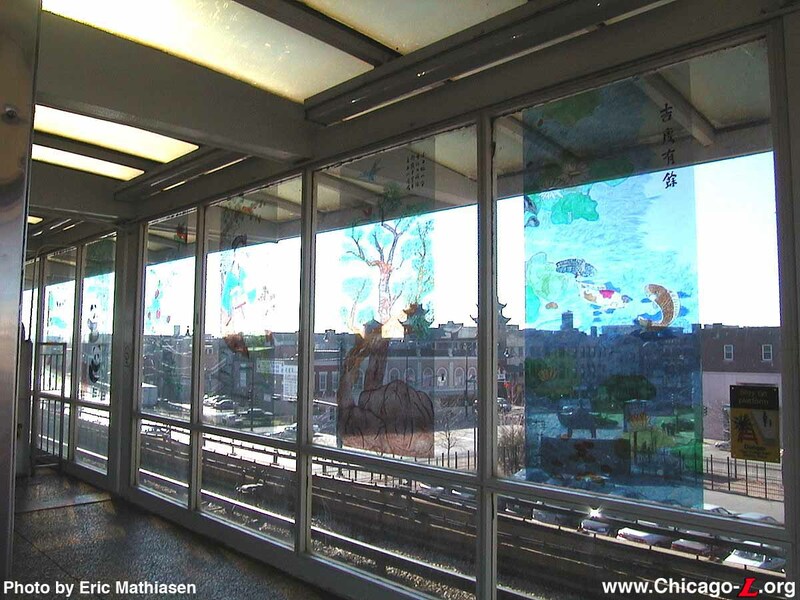 On October 7, 2003, the Chicago Transit Board approved a $192.5 million contract to rehabilitate the Dan Ryan branch, with Kiewit/Reyes, AJV (A Joint Venture) awarded the construction contract as part of a competitive bid process. The total cost of the Dan Ryan rehabilitation program was $282.6 million. Dan Ryan renovation work was completed in early 2007. 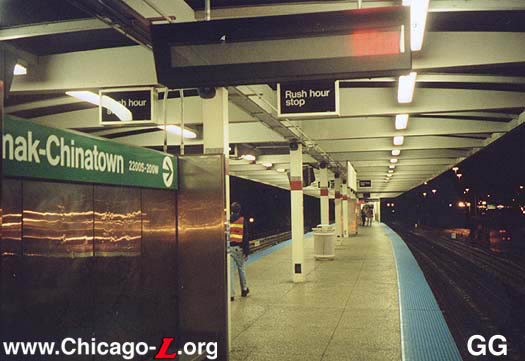 The CTA undertook a substantial signage improvement project in 2006, with work throughout the year and wrapping up in winter 2006-07. Contractor Western Remac, Inc. won the competitively bid contract for the Red Line Wayfinding project. At Cermak-Chinatown, the project replaced the station name and column signs on the platforms, provided granite compasses roses in front of the entrance on the north side of Cermak Road, and mounted three-sided map/schedule pylons on the platform and at street level in front of the station entrance on the north side of Cermak (the latter of which later destroyed in a truck collision in 2008; see below). 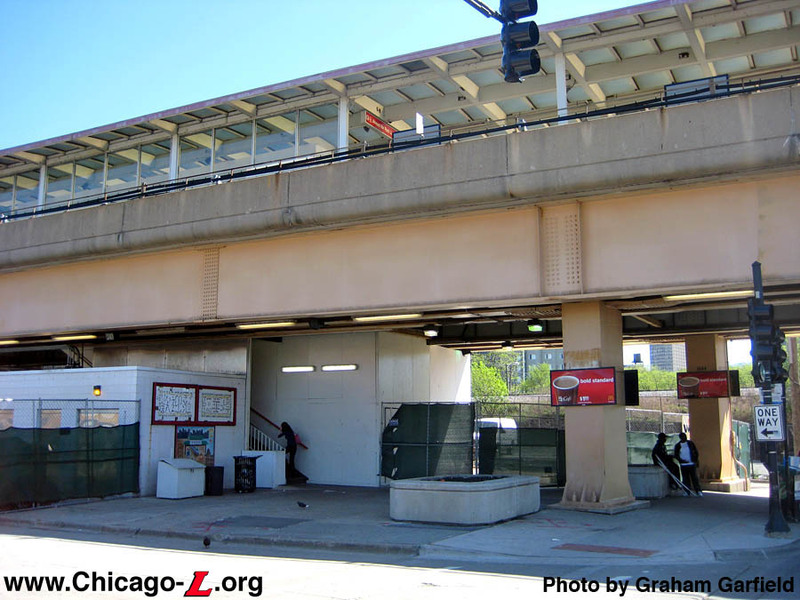 The entrance to the Cermak-Chinatown station on the north side of Cermak Road, which most customers used, stood at the foot and slightly to the east of a multi-lane entrance and exit ramp from the Dan Ryan Expressway, intersecting at a traffic light-controlled intersection. During the evening rush hour on Friday, April 25, 2008, a semi-truck careened off the exit ramp, through the stop light and across Cermak Road, and collided with the north side entrance. Two women were killed and 21 others were injured in the accident. The truck made it into the station entrance, severely damaging the escalator and stairwell, as well as a large illuminated station entrance sign, a heavy, ruggedized information pylon, and several other pieces of infrastructure. The CTA was able to repair the stairway and reopen the north entrance within a day or two -- customers were able to access the station through the entrance on the south side of Cermak Road in the meantime -- though the CTA lacked the funds to replace the escalator, which remained out of service and walled off with plywood. The accident suggested a need for a more protected customer environment. In the short-term, planters with reinforced sides were erected around the perimeter of the station entrance. 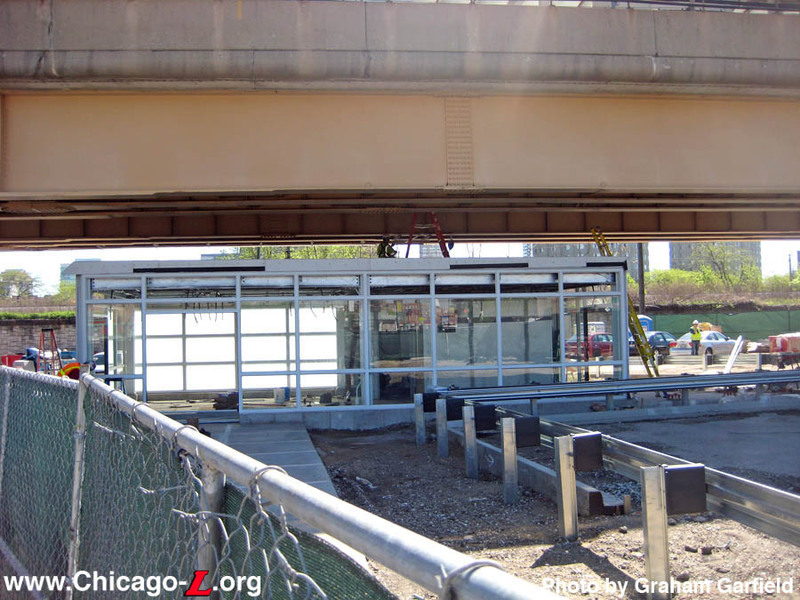 In terms of more long-term solutions, initially the CTA considered erecting a barrier wall in front of the station to prevent the same type of accident. 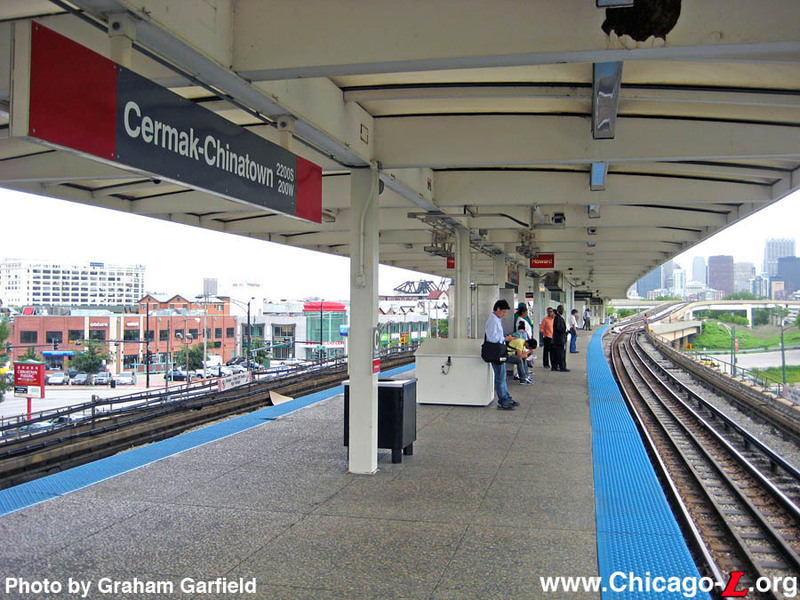 However, there has also been a desire for a more substantial station facility at Cermak Road, with greater capacity and amenities than could be provided in the narrow space at platform-level that housed the fare controls since the station's opening. The addition of an elevator to improve accessibility was also a desired improvement. At the same time, as part of the federal government's economic stimulus package to help stem the deep recession the nation was experiencing at the time, federal grants were available for "shovel-ready" infrastructure projects that could provide construction jobs and result in improvements to transportation infrastructure. 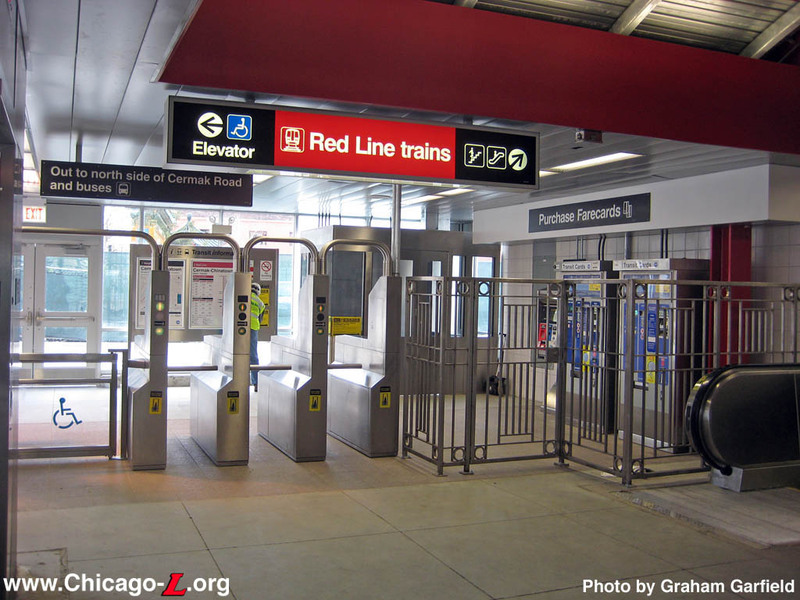 All of these factors combined to allow CTA to pursue a more substantial solution: a new street-level station house at Cermak Road, with a new elevator to provide accessibility. 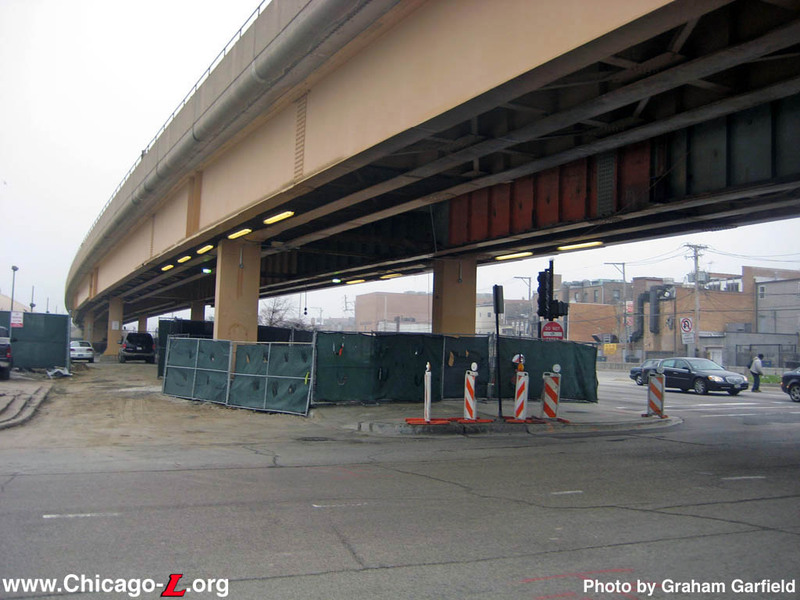 To pay for the project, the CTA applied for and was granted $12.5 million of federal ARRA (American Recovery and Reinvestment Act of 2009) stimulus funds. 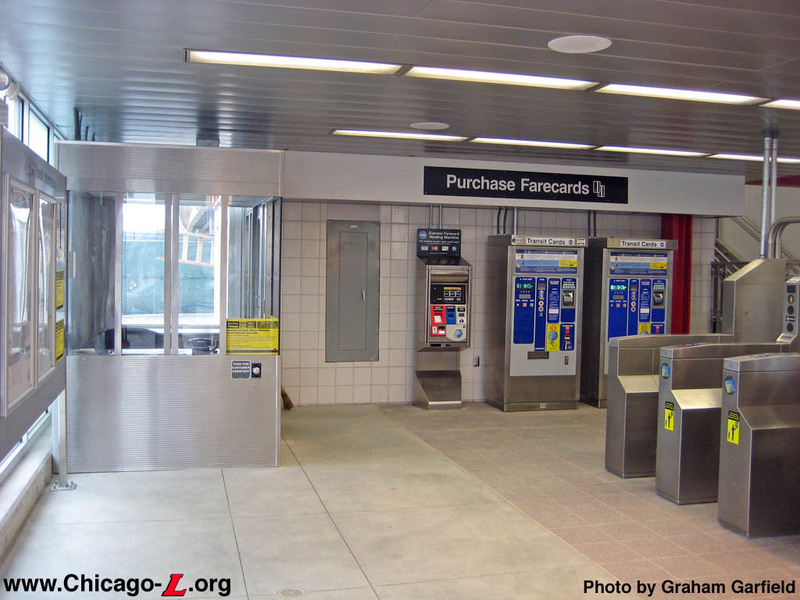 The project included a new main entrance on the north side of Cermak Road, including a new street-level station house and fare control facility to replace the original platform-level fare controls. The new station house was designed to harmonize with the Skidmore-designed 1969-built stations on the Dan Ryan branch, including a rectilinear shape, the use of white-painted steel framing, large picture windows, a box cornice on top, and an overall open, transparent, airy feel. The station included entrances on the west and south elevations at the southwest corner of the building, and a roto-gate controlled exit on the east elevation of the building. An elevator stood in the middle of the south elevation. 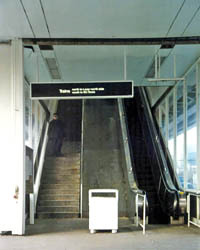 A new escalator was included in the design to replace the one damaged in the 2008 track collision. The new station house would provide more turnstiles and farecard vending machines and increased passenger flow capacity compared to the old platform-level fare controls. Existing ancillary equipment and utility rooms to the sides and behind the stairs and former escalator were integrated into the new building. Other amenities included bike racks, a waiting area for customers transferring to buses, new signage, new security cameras, landscaping, public art, and steel-reinforced planters and bollards to protect the station house from errant vehicles coming off the expressway exit ramp. 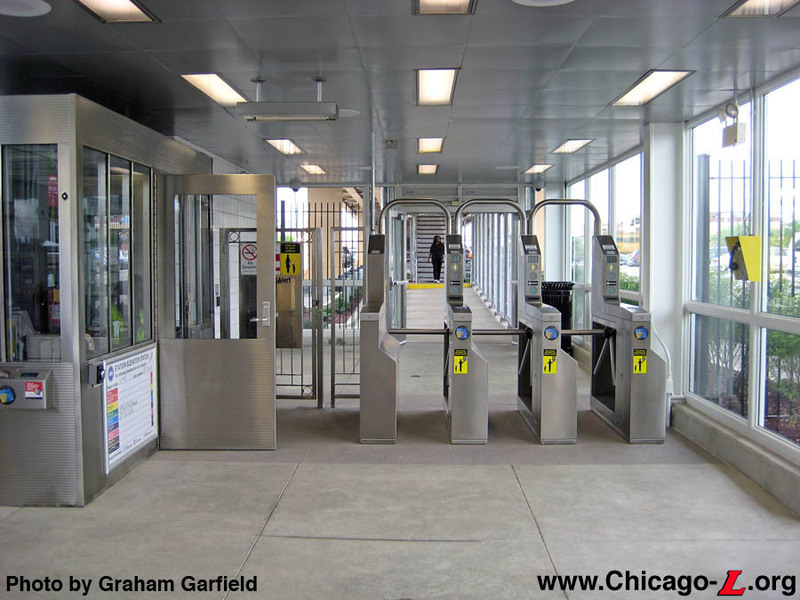 In addition, the project provided a renovated entrance on the south side of Cermak Road with high-barrier fare gates, and a new auxiliary entrance at the north end of the station at Archer Avenue. 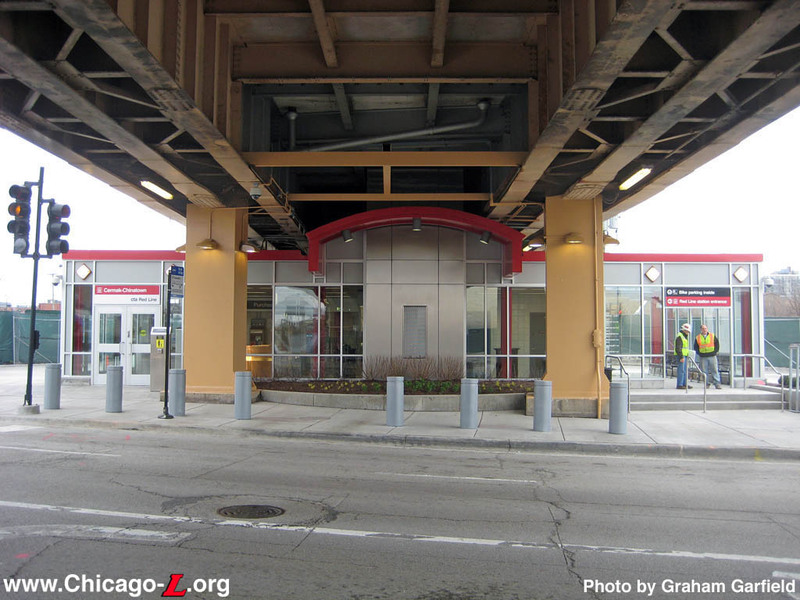 The Archer Avenue entrance included a small station house that used a similar design to the new Cermak entrance, on a smaller scale. The Archer entrance would provide better, more convenient access to the station from the north end of Chinatown where much development had taken place since the station opened in 1969, including the Chinatown Square development. 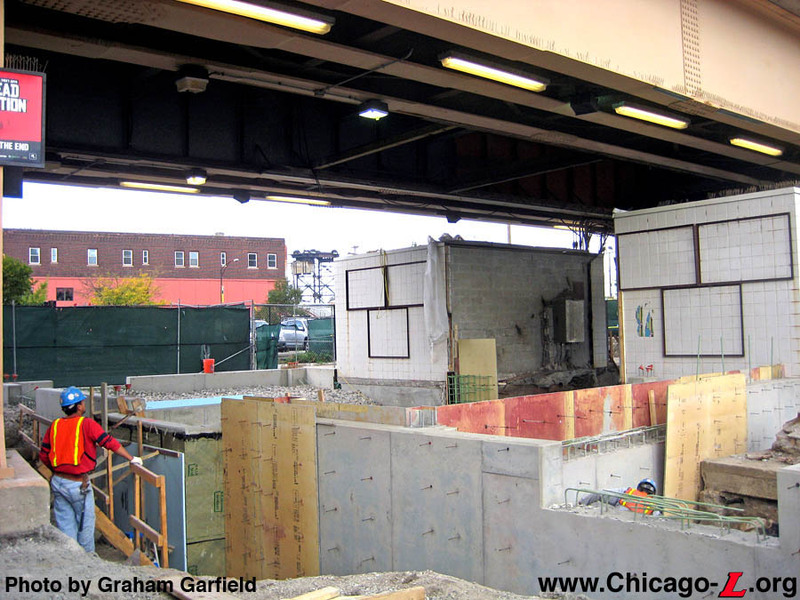 It also provided for better staging of the construction by creating an alternate entrance to the station, allowing the Cermak entrances to be completely closed to be rebuilt, resulting in a faster, more economical project. 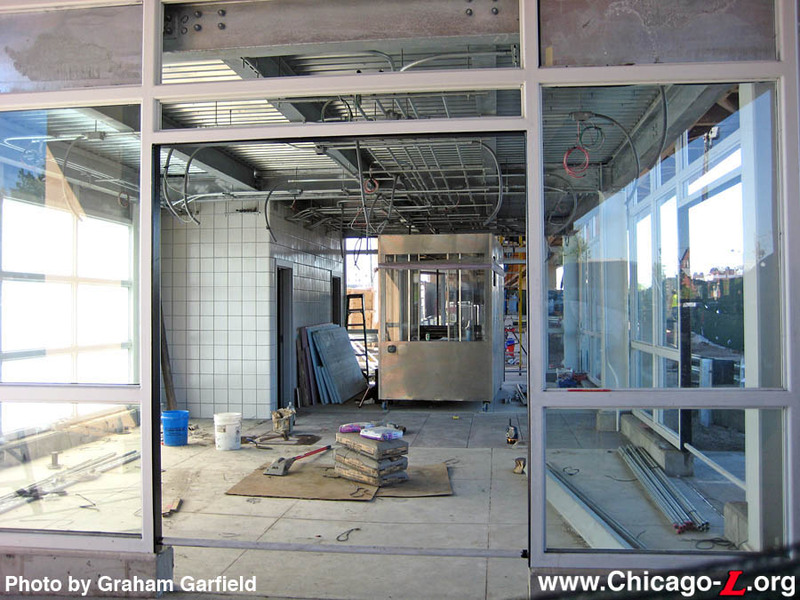 The Archer entrance would ultimately be an unstaffed farecard-only entrance, but the station house there was designed to accommodate a Customer Assistant booth, regular turnstiles, and farecard vending machines during construction of the new Cermak Road station house. 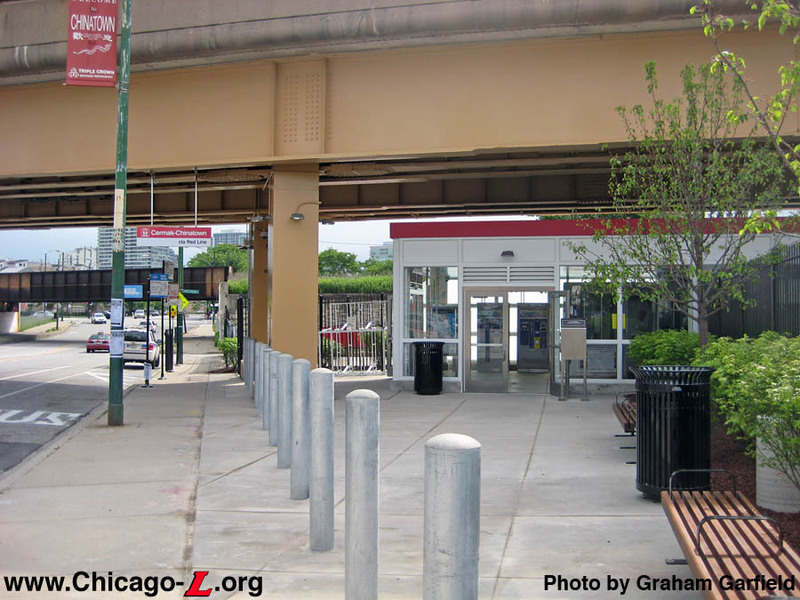 The rebuilt auxiliary entrance on the south side of Cermak Road reoriented the entrance to face Cermak Road, with High-Barrier Gate (HBG) turnstiles at street-level. Wight Hill, A Joint Venture was awarded the contract through a competitive bid. The project started in late Fall 2009 and was expected to have a duration of roughly a year and a half. 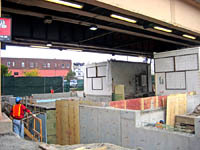 To stage the construction while keeping the station open during the project, the new access from Archer was constructed first. 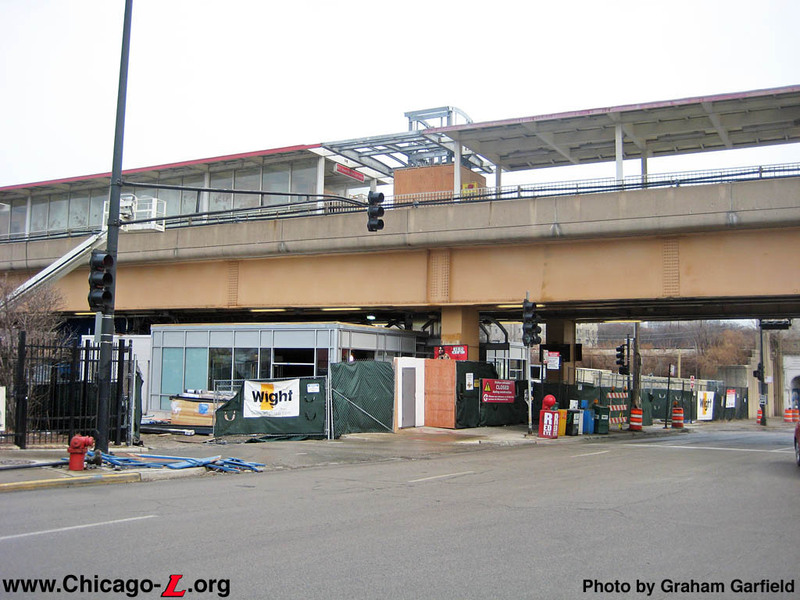 Once the new entrance at Archer was complete, the Cermak entrance temporarily closed for reconstruction and the Archer entrance temporarily became the station's main entrance. The construction of the Archer entrance began in November 2009. During Winter 2009-10, footings were poured, utilities were being rerouted, and steel fabricated. 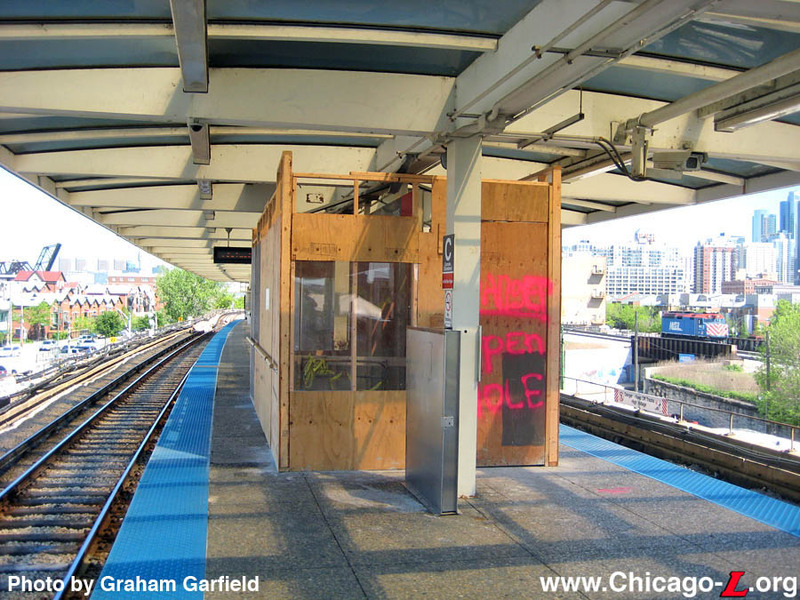 In late April 2010, an opening was cut in the north end of the island platform and the stairs down to the Archer station house were installed. During early spring, the concrete walkway between the Archer station house and sidewalk was poured and fabrication of the auxiliary station house continued. 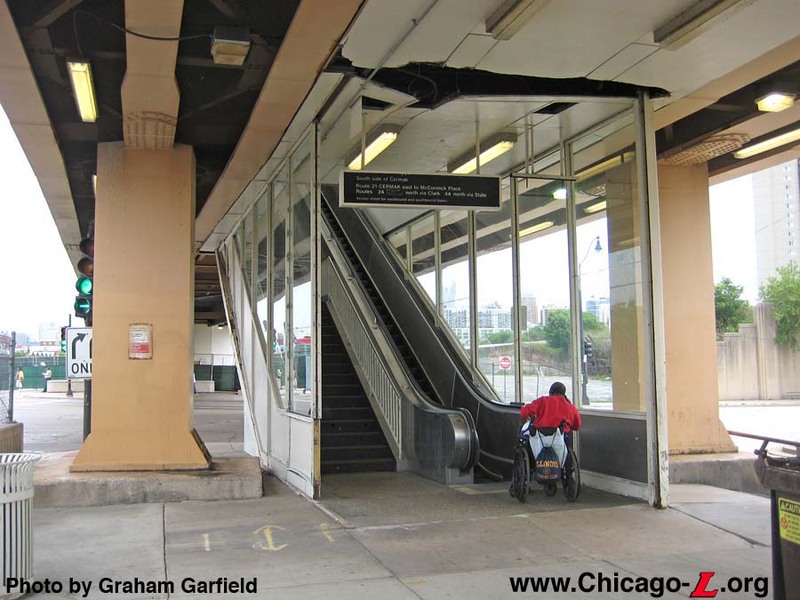 At the Cermak main entrance, the damaged escalator was removed and the site was prepared for a new escalator. New electrical was also run from the electrical rooms at Cermak Road to the Archer entrance. The Archer entrance opened at 5am, Friday, June 4, 2010, staffed with a Customer Assistant and equipped with turnstiles and farecard vending machines. Both entrances, at Cermak and at Archer, remained open for a day while customers acclimated, then the entrances on both sides of Cermak Road were closed at 11pm the same day. To provide convenient transfers, the #21 Cermak bus was rerouted to serve the Archer entrance, and the #21 Cermak and #62 Archer buses stopped within a half-block of the entrance. 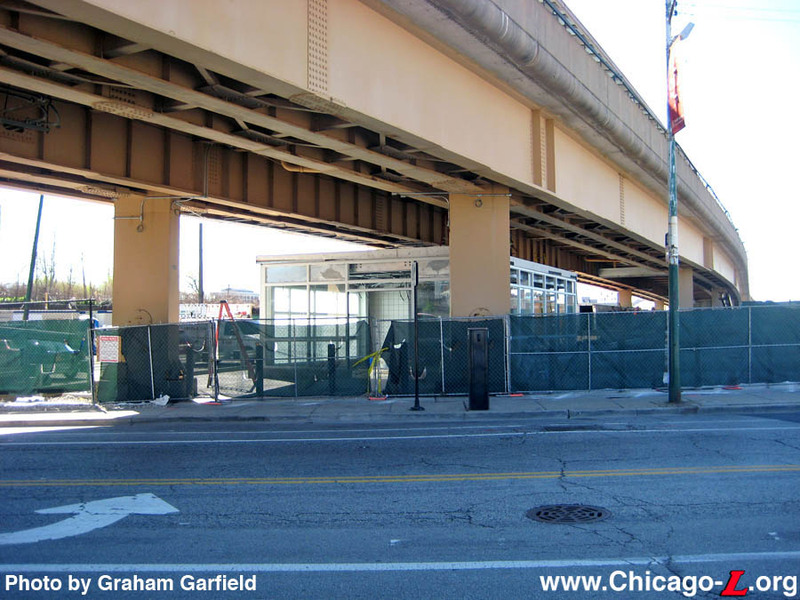 An engineers' strike during the summer of 2010 and the discovery of a previously unknown underground gas main pushed completion of the new station house on the north side of Cermak Road back from the end of 2010 to the first quarter of 2011. The gas pipe's location forced some redesign of the east side of the station house. By early Fall 2010, the elevator and escalator for the new station house were being fabricated. Utility relocation and excavation were also underway. The foundation for the new station house was being fabricated, and the old stairs from the platform to street-level were being demolished. In November, the concrete foundation walls were poured, as was the elevator pit, and the excavated ground within backfilled and graded. 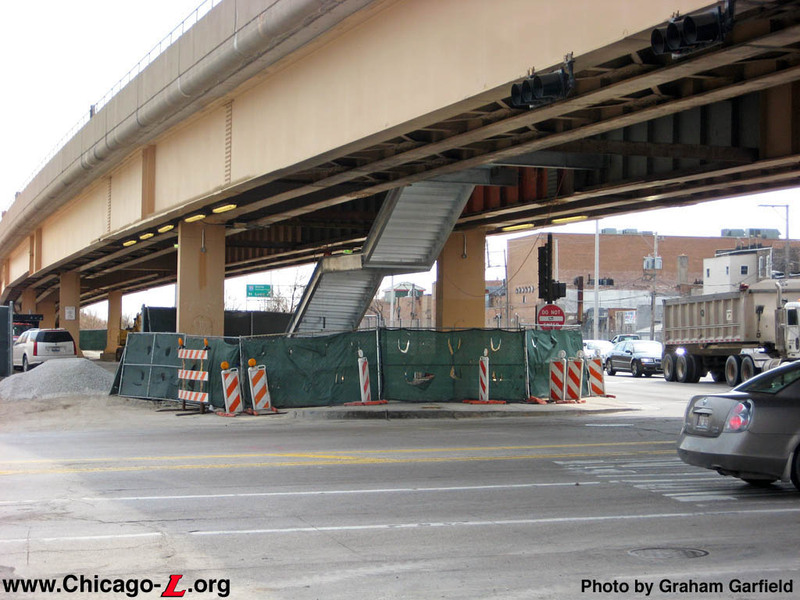 In December, a section of the existing elevated platform concrete was removed to accommodate the new escalator, stairs and walkway over Cermak Road. A section of canopy in the same area was also removed to allow for the installation of the new vertical access elements. Plumbing was also roughed in for the new employee restrooms and janitorial facilities. In January 2011, the underground work was complete and the contractor poured the slab for the new station house floor. The station house area was prepared for steel erection to begin, while the elevator tower was lifted into place, in two pieces, over the night of January 21-22. The new elevator and escalator were being fabricated off-site while light fixtures were replaced at platform level. 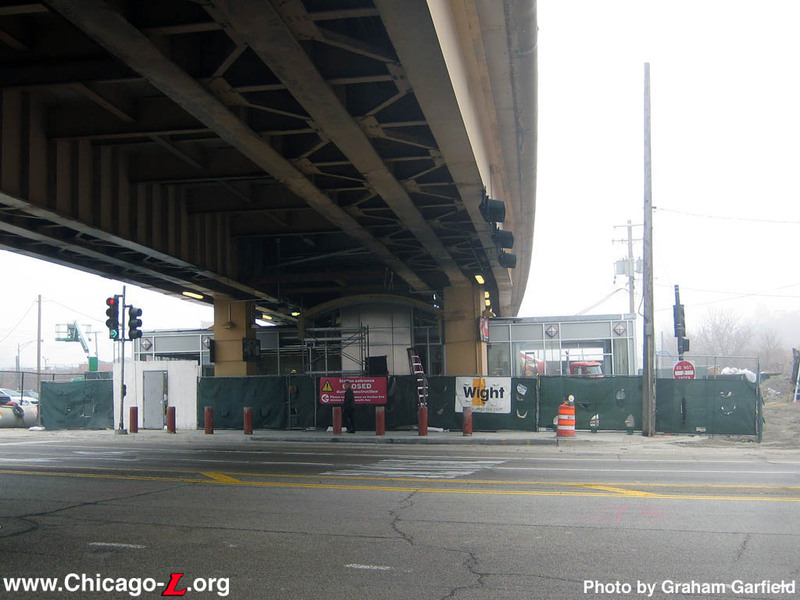 Meanwhile, the design of the new auxiliary entrance on the south side of Cermak Road was completed, and was being priced and scheduled by contractor. By February, the contractor was erecting the structural steel for the new station house, followed by installing the curtain walls around the exterior. The new stairway and escalator were also installed, along with the elevator skin, electrical, and communications conduits and runs. During March, finishes such as window glass, doors, interior glazed wall tiles, and lighting was installed. The Customer Assistant kiosk was delivered during this period. Contractor crews spent early and mid-April finishing the details of the new station house facility. Work inside the station continued, with the CA booth set in its permanent location shortly before the station opened. Concrete planters were installed outside the station house, along with reinforced concrete bollards along the street in front of the station for added safety and protection from vehicles. Other items installed during this period included bike racks in a semi-enclosed bike parking facility adjacent to the east side of station house, and new signage throughout the station facility. Fare equipment was installed inside the station house shortly before the new facility opened. 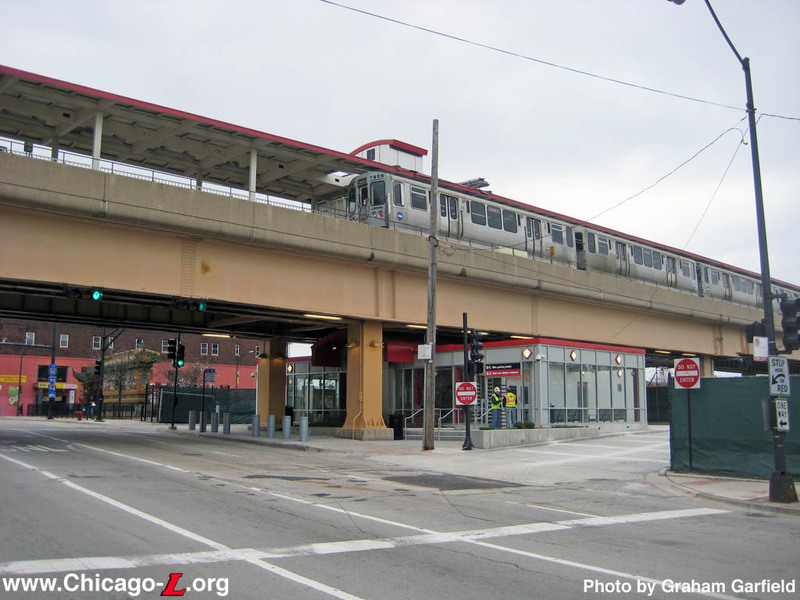 The new station house on the north side of Cermak Road opened at 2pm, Friday, April 15, 2011. 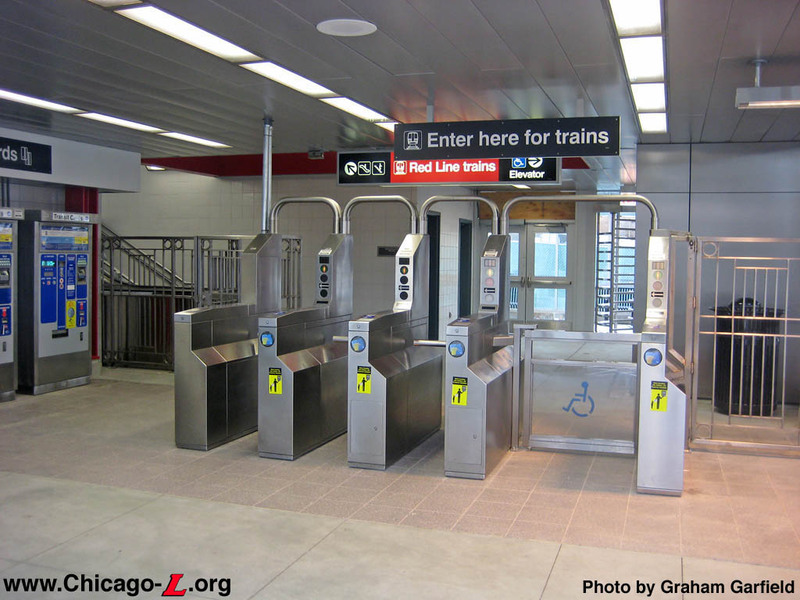 Upon the new main entrance opening, the elevator came into use and Cermak-Chinatown became the 92nd of the CTA's 144 station to become accessible, with other ADA-compliant features including an accessible turnstile, tactile platform edging, gap fillers, and Braille signs. 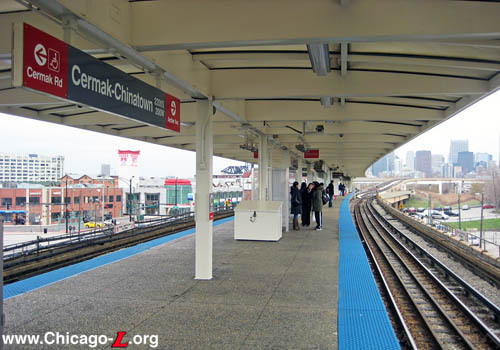 City and CTA officials dedicated the renovated Cermak-Chinatown station on Saturday, April 23, 2011. Mayor Richard M. Daley, Chicago Transit Board Chairman Terry Peterson, CTA President Richard L. Rodriguez and 25th Ward Alderman Daniel Solis, along with community representatives, gathered to celebrate the completion of renovations on the at the main entrance on the north side of Cermak Road. Mayor Daley made the event another stop on the "Neighborhood Appreciation Tour" he is making before he leaves office in May 2011, thanking the residents of the 25th Ward for their help in moving the City forward. Work on several parts of the station continued after the dedication. 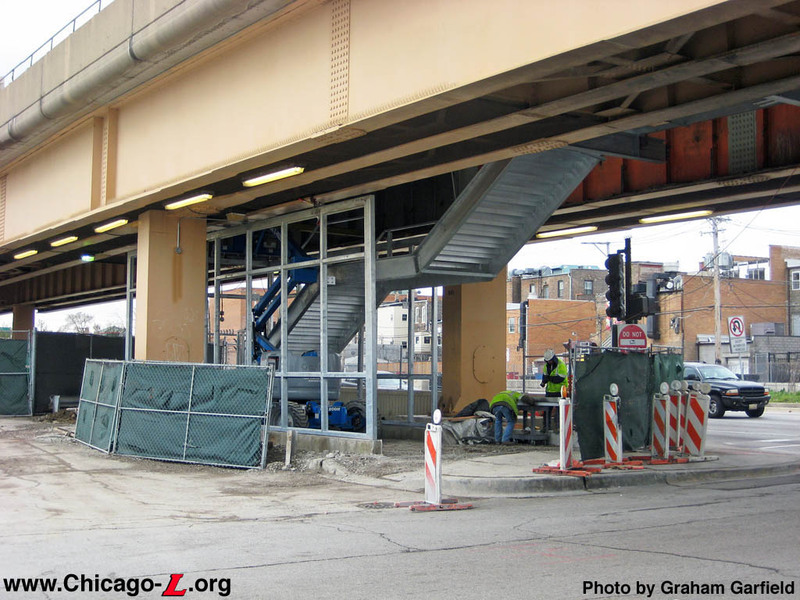 The auxiliary entrance on the south side of Cermak Road reopened at 11:15am on Saturday, April 30, 2011. 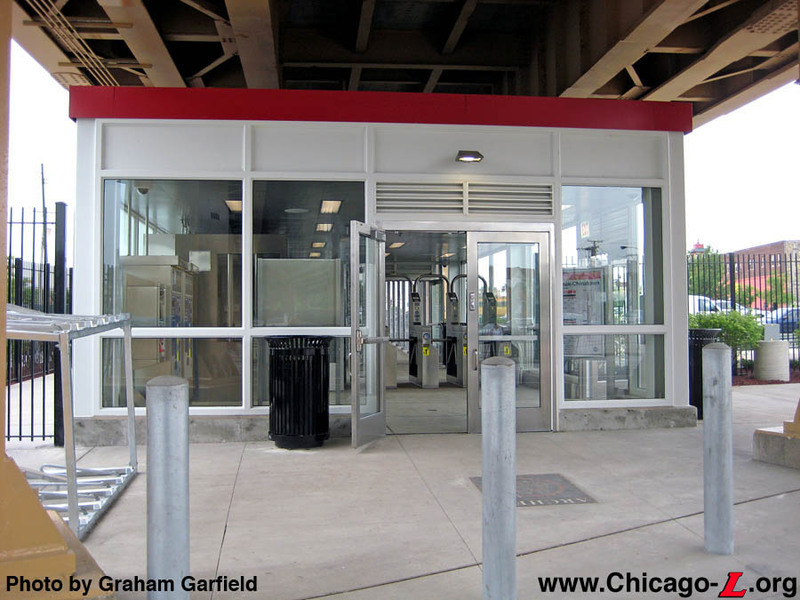 The rebuilt entrance faces Cermak Road for better visibility, and includes a small enclosure with two HBG turnstiles at street level. Over that weekend, the Archer entrance was also converted to an unstaffed HBG entrance. The Customer Assistant booth remains, but the farecard vending machines and regular turnstiles were removed and HBG turnstiles installed. The entrance remained open during the conversion, with a portable farebox used to collect fares. Other finishing and punchlist work is expected to continue into Summer 2012. Station name signs outboard of the tracks, facing the island platform, were installed in Summer 2012, as were CTA identifiers -- a large CTA logo flanked by smaller train and bus mode icons -- on both sides of the elevated structure over Archer Avenue and Cermak Road. 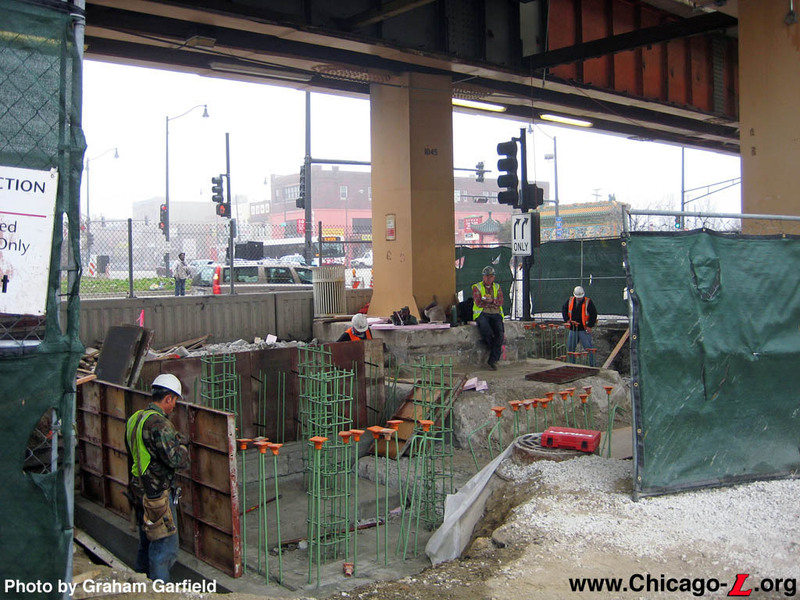 In 2013, the CTA launched the Red Line South Reconstruction Project, a track renewal project to rebuild the Dan Ryan branch tracks from the bottom up, excavating down to the bottom of the trackbed to rebuild the underground drainage system then installing new ballast, ties, and tracks. 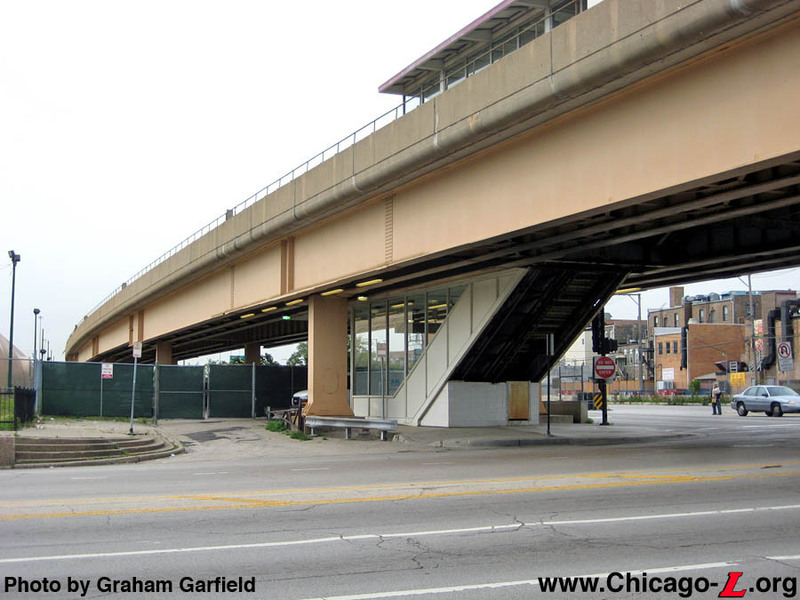 In order to perform the work more quickly and cost-effectively, the CTA closed the Dan Ryan branch for five months while work was performed. 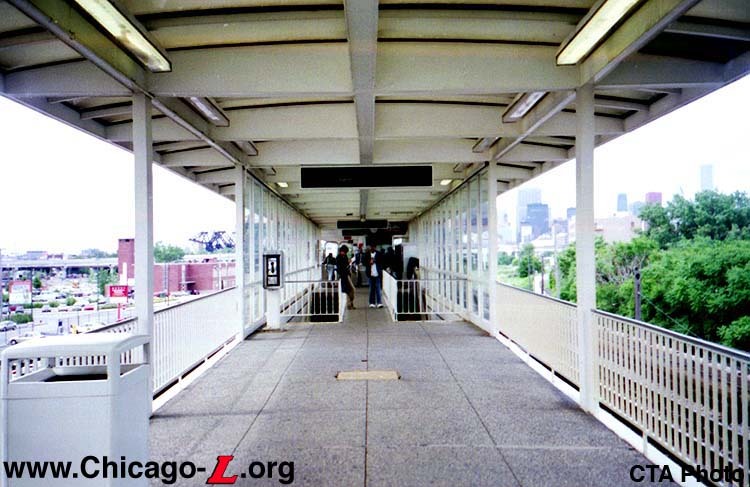 During that time, there was no 'L' service on the Dan Ryan branch south of Roosevelt station. 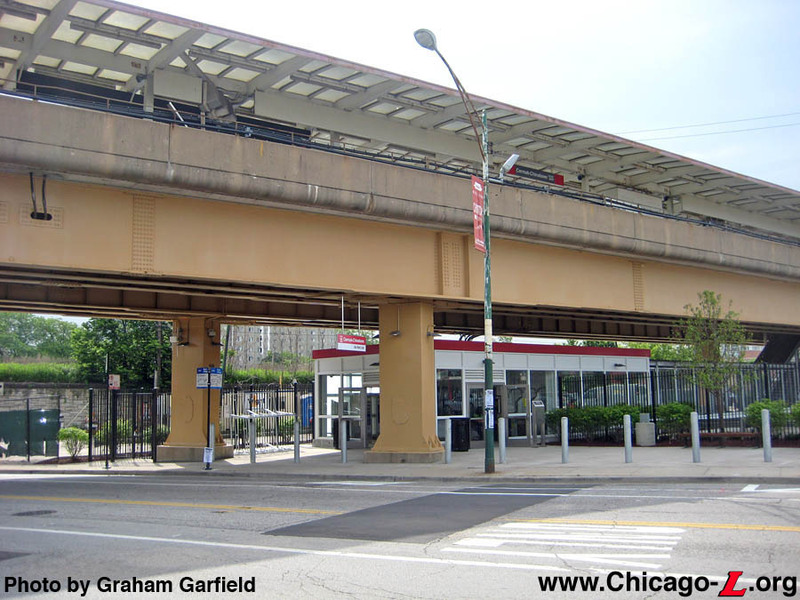 Red Line trains were rerouted via the old 13th Street Incline from the State Street Subway to the South Side Elevated, where they operated to Ashland/63rd via the South Side Elevated tracks in a pattern reminiscent of the old Howard-Englewood "A" trains of the North-South Route days. 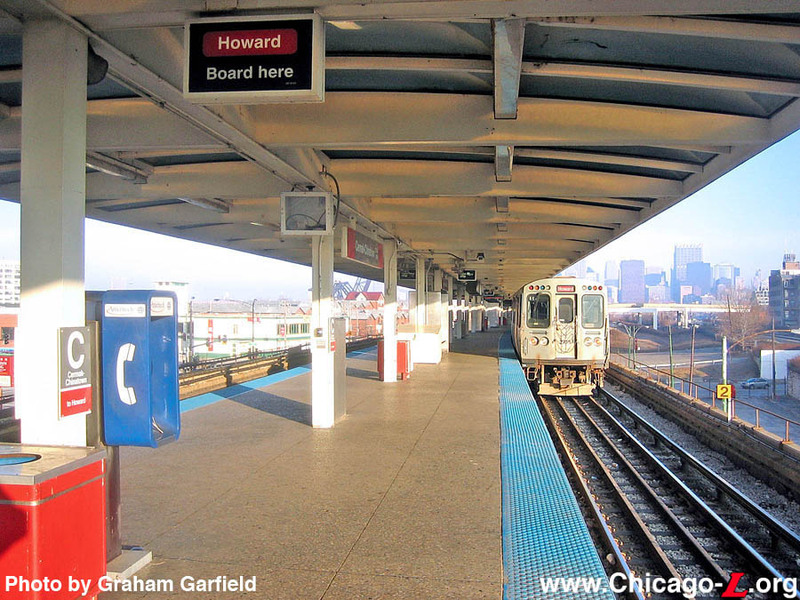 Red Line service to Ashland/63rd began on Sunday, May 19, 2013. Following the five-month track reconstruction and renovation work on the Dan Ryan, Red Line service to 95th resumed at 4am, Sunday, October 20, 2013. The five-month construction option saved $75 million over an option to perform work on weekends only. 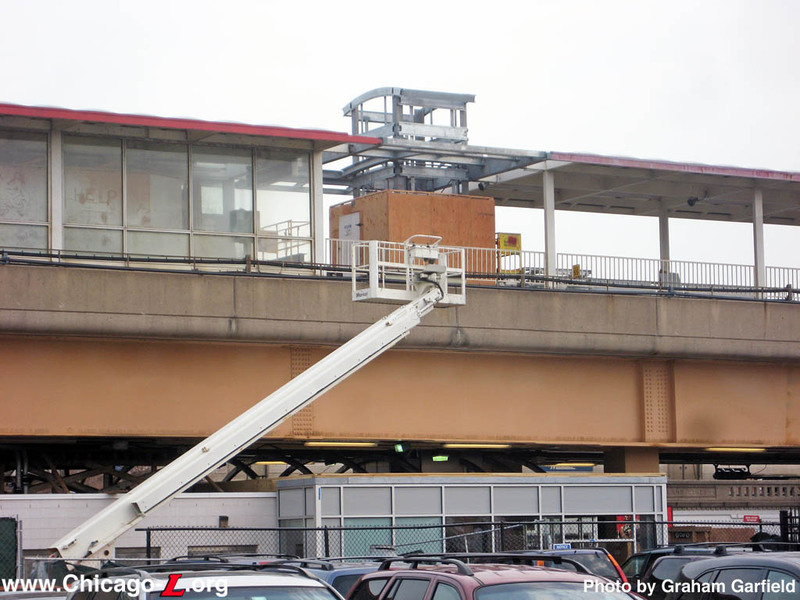 CTA invested that $75 million savings into station upgrades along the south Red Line, including lighting improvements, painting, new roofs and canopies at some stations, electrical substation work, and other improvements. 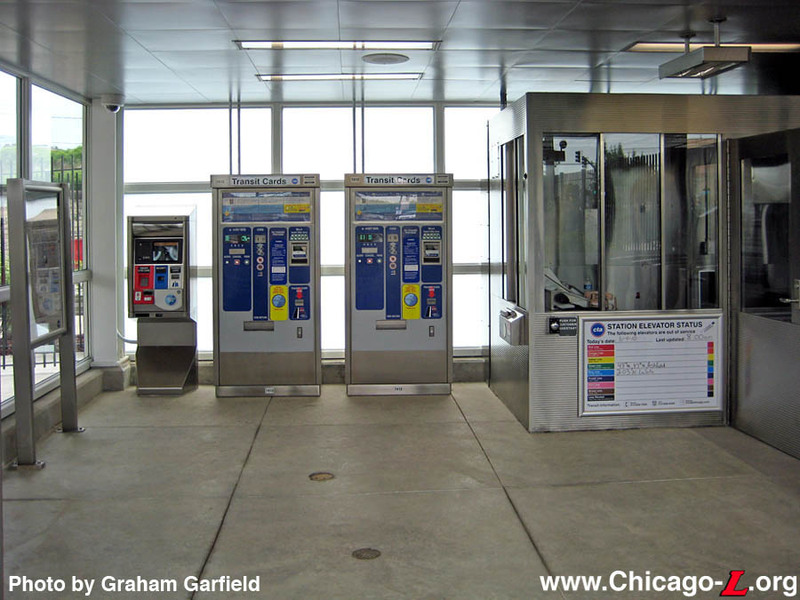 In addition, elevators were added to the 87th, 63rd, and Garfield stations, making the whole Dan Ryan branch, and indeed all "L" stations on the whole South Side, accessible.